Cloud gaming demo service Gaikai has some new free demos up and running. They are Air Conflicts: Secret Wars, Game of Thrones and Warlock: Master of the Arcane. With Air Conflicts: Secret Wars we have another opportunity to compare the quality of game graphics and the video streaming quality for OnLive and Gaikai, as the game is now available on both cloud gaming services. 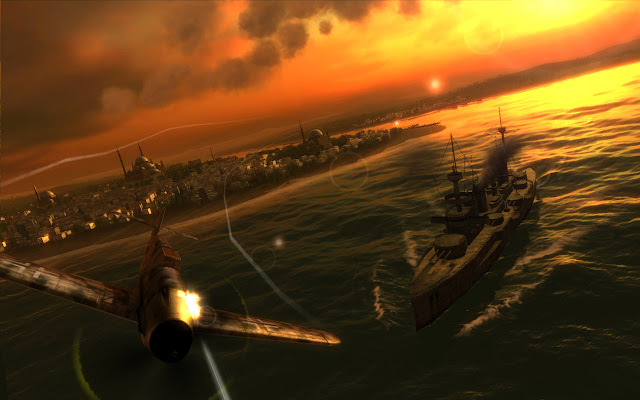 You can play the free demo of Air Conflicts: Secret Wars powered by Gaikai (OnLive Demo). Game of Thrones is a role-playing game based on A Game of Thrones, the first of the A Song of Ice and Fire novels by George R. R. Martin, and in part also on the novels' TV adaptation by HBO, Game of Thrones. It's published by Focus Home Interactive and developed by Cyanide Studios. Experience an amazing adventure in one of the most complete and fascinating universes in medieval-fantasy literature. Game of Thrones is a great role-playing game that puts you at the core of a thrilling plot, where your fate will be guided by vengeance, allegiance and honor. The story of Game of Thrones takes place during the first book of the saga, at the time when Jon Arryn, the Hand of King Robert Baratheon, is found dead at King's Landing. The game allows players to follow two epic quests: Mors and Alester's quests. Their totally original story was canonized by George R. R. Martin himself and perfectly integrates the original story the fans are so familiar with in the series. All throughout the game, the numerous references to books, characters and famous locations form an impressive Westeros encyclopedia, which players can consult at any time during their adventures. Developed with the Unreal Engine 3, Game of Thrones displays a visual environment that does justice to the universe of A Song of Ice and Fire. From textures to environments, from animation to characters, and to light effects… Game of Thrones is a game with impressive visuals on both consoles and PC. The Wall, the Northern snowbound forests, King's Landing, and Red Keep have never seemed so real! One glance will be enough to plunge fans of the series into the mythical locations they already know so well. Motion-capture, voice acting for each character encountered and lip-sync bring all the inhabitants of Westeros to life and are actively participating in immersing the player in a huge, mind-blowing universe. Game of Thrones has all the essential ingredients for a great role-playing game: choose your characters' classes and their style of combat, find the right balance between your strengths and weaknesses, and prepare yourself for epic fights! Obtain the best gear, weapons and armor adapted to your personal approach to combat and gain experience to improve your skills or learn new ones. Game of Thrones‘ combats take on epic as well as tactical dimensions! Prepare two sets of complementary weapons (for example: sword and shield for melee, bow for long range combats) and choose the most appropriate weapon depending on the direction the battle takes. At any moment during combat, you will have the option to switch into slow motion to analyze, anticipate and adopt the best attack or defense tactic! Plan up to 3 special attacks for each character under your control and launch them at the best moment to amplify their effects! If Mors' dog is useful to launch violent attacks and disarm your enemies, Alester's powers enable him to enflame his weapons and launch zone attacks of devastating proportions. Whatever happens, don't neglect the tactical aspect of combat...if you don't want to suffer heavy defeats! Dialogues play a key role in George R. R. Martin's work and thus also take on that key position in the fantasy role-playing game. Particular attention has been paid to the discussions that you will follow in the game. Lip-synching, character voiceovers and cinematographic cameras make your verbal jousts all the more realistic and immersive! The quality of the writing and of the retorts, as well as the multiple possible responses will instantly plunge you into the spirit of the saga. Each character prepares their responses according to their personality; therefore, choose carefully the character with whom you want to reply, your choice will have important consequences! Your political talents are as sharp as a sword so don't underestimate the power of dialogue to get you out of a critical situation, to gain experience and sometimes to progress peacefully in the adventure. 2 original stories based on the universe of A Song of Ice and Fire by George R. R. Martin. Many secondary quests to complete. Explore the mythical locations from the saga, and meet iconic characters. You can play the free demo of Game of Thrones powered by Gaikai. Warlock: Master of the Arcane is a turn-based fantasy strategy game and the latest game in the popular Majesty series. It's published by Paradox Interactive and developed by Ino-Co Plus. Warlock: Master of the Arcane is a turn-based strategy game played on a hex based map, set in the lands of Majesty's Ardania. It has a modern look and feel yet inherits the best elements of the famous turn-based strategy games of old. The underlying aim of the game is for players to overcome a variety of strategy and tactical challenges, in order to unify the land and be crowned Warlock – Master of the Arcane. During the course of the game players are expected to explore the lands and uncover potentials sites, for new cities to be founded. Neutral cities can be captured and sacked or kept intact, for the benefit of the kingdom. As can those of rival factions. Within the territory of a city, a host of buildings can be constructed; to provide a range of resources, to commission army units or equip them with upgrades to bolster their combat abilities. Some unqiue buildings must be placed upon rare resources which can be found across each map. These provide larger amounts of resources, more powerful units or stronger unit upgrades. With large armies marching across the landscape, players must create and command an assortment of powerful units to fight in epic battles against a myriad of deadly enemies. To unify the factions, players will have to develop their own tactics and learn to use the units available to them and the special abilities they are inbued with. Add some magic to this mix and players will develop a more than capable strategy achieve victory. In order not to be left behind in the ultimate arms race, players are required to research and master a multitude of spells. Strong enchantments can enhance the capabilities of both cities and units. While powerful offensive spells can eliminate or weaken enemy units, so they are easier to wipe out. Diplomacy can be conducted when other factions are encountered. If they are weak, they can then be crushed. If they are powerful they may be used to help wear down a more potent threat. Resources and assets can also be exchanged with friendly neighbours in times of need. Players can choose to take the side with one of the eight gods, satisfy their whims and become the main representative of their spiritual churches on Ardania. Periodically the gods may send quests that must be fulfilled within a limited time. Successfully completing these quests will not only provide rewards of gold and other resources, but also boost the reputation of the faction with that particular god. If the faction's reputation rises high enough, the faction may be granted powerful units or spells. Be warned though, that the other gods may become jealous and send their own representatives to teach the player's faction a lesson. Ultimately the goal of the game is to unify Ardania under one banner. There are four ways to achieve this. Defeat all the other Great mages. Seize all the Holy Grounds – your mage will become the only priest of the Conclave. Cast the great “Unity” spell – the highest spell in the game, and very difficult to research. By doing this, your mage commands all of the magical powers in the world of Ardania. Defeat a god’s avatar. An avatar will appear in the world to attack any Great Mage who reaches a “hated” reputation status with any god. You can play the free demo of Warlock: Master of the Arcane powered by Gaikai.